The figures for 2012 by the International Agency for Research on Cancer put the new cancer cases at 14.1 million that year. Deaths for that year were 8.2 million. Estimates say that by 2030, there should be as many as 21.7 million new cases of cancer along with 13 million deaths related to the disease. It is probable that the cancer rates by country will further increase in the future as Western lifestyle habits spread, including poor diet, smoking, and physical inactivity, affecting developing countries as well. To get a better idea of the cancer rates, take a look at the following data from 2011. The information is listed in terms of the number of cancer cases for every 100,000 people. 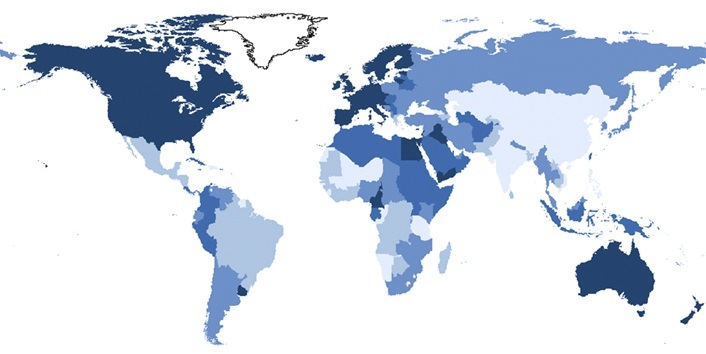 Now that you know the cancer rates by country, here are more facts about cancer. 1. It Is the Leading Cause of Death. Cancer is considered to be the top cause of death around the world. In 2008, it accounted for about 13 percent of all deaths, 7.6 million. In over 30 percent of cancer cases, it could be prevented by modifying or removing important risk factors. These include smoking tobacco, being overweight, not eating enough fruits and vegetables, being physically inactive, contracting a sexually-transmitted HPV infection, pollution in urban areas, and indoor smoke from using solid fuels at home. 3. Its Survival Rates Differ. Certain types of cancers see dramatic differences in the survival rates, depending on whether the patient is in an economically developing or developed country. The five-year survival rate of breast cancer, for example, is 32 percent in Sub-Saharan Africa but 81 percent in the United States. Developed countries are more likely to have early detection and treatments which can lower death rates. 4. Lung Cancer Is the Most Common One. Among males, lung, prostrate, stomach, colorectal, and liver cancer were the most common while females most commonly were diagnosed with breast, colorectal, cervical, lung, or stomach cancer. Overall, lung cancer was diagnosed in 1.8 million people (13 percent of cancers diagnosed); breast cancer received nearly 1.8 million diagnoses (12 percent); colorectal cancer had 1.4 million (10 percent of diagnoses); prostate cancer was at 8 percent with 1.1 million people; stomach cancer at 7 percent with 0.95 million; liver cancer at 6 percent with 0.78 million; and cervical cancer at 4 percent with 0.53 million. 5. Lung Cancer Is Also the Top Killer. The most common cancer causing death was lung cancer, affecting 1.6 million people or 19 percent of cancer deaths. Liver, stomach, and colorectal were each responsible for 9 percent of cancer deaths, affecting 0.75 million, 0.72 million, and 0.69 million people, respectively. Breast cancer killed 6 percent or 0.52 million people. Now that you know the cancer rates by country and which are the most common, find out how to prevent cancer and stay healthy. Up to 80 percent of cancers are caused by environmental factors or genetic mutations that mimic or enhance insulin's effect on the tumor cells. Because of this, experts suggest not having more than 25 grams of fructose a day, though 15 grams is ideal. Multiple studies have shown that vitamin D deficiencies are linked to cancer development. Experts suggest that around 30 percent of deaths due to cancer could be prevented by getting enough vitamin D.
Exercise reduces the risk of cancer in several ways, including by reducing any insulin levels that are elevated. This in turn makes a low-sugar environment that discourages the spread and growth of cancer cells. How Tall Is the Tallest Person in the World?